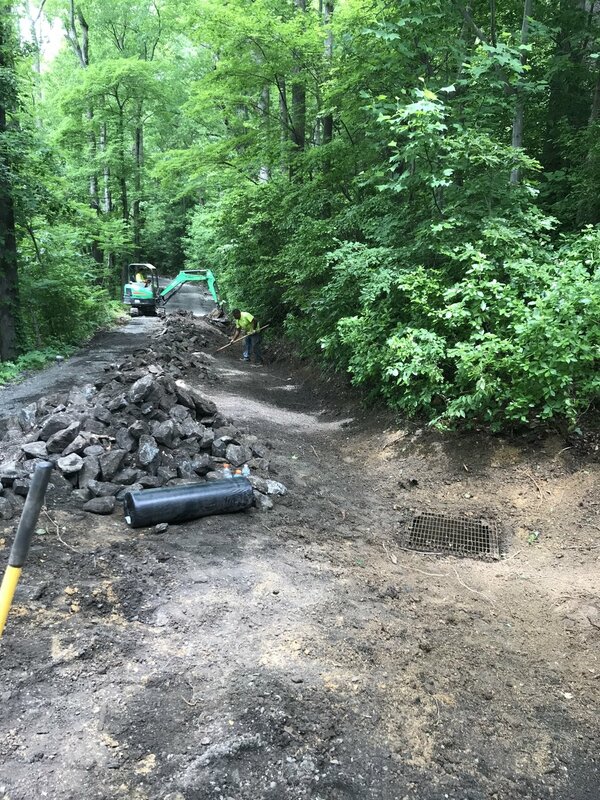 Repairs to three large stormwater ponds for the Pemrbooke HOA in Lexington Park, MD. Repairs included filling in and stabilizing erosion, removing sediment from inside of the ponds, and repairing sunken stone and pipe aprons. The community shouldn’t have a problem getting through their MDE Inspection this Spring. 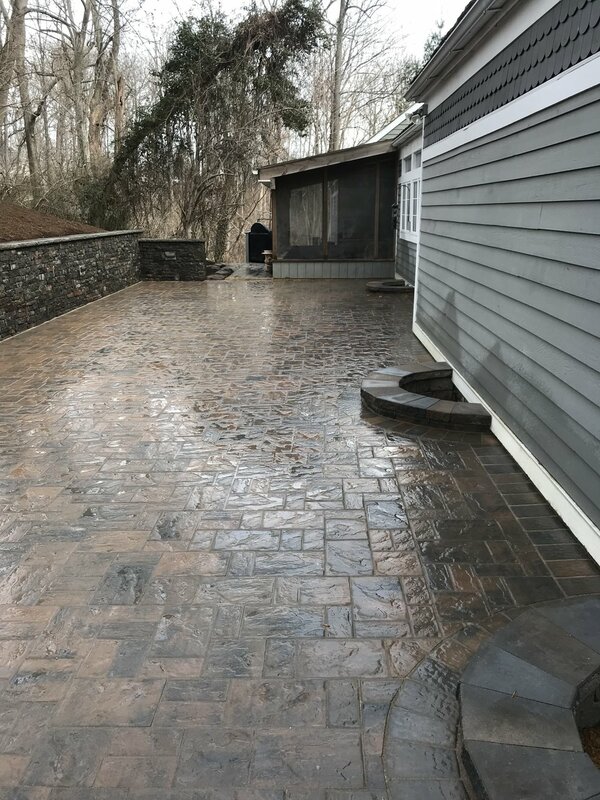 New Pavers Sidewalk installation in Huntingtown, MD. Cambridge Pavers used to dress up the front of this house. Cambridge Ledgestone 3-Piece in Toffee Onyx Light with a darker border. Circle kit in front of the steps. 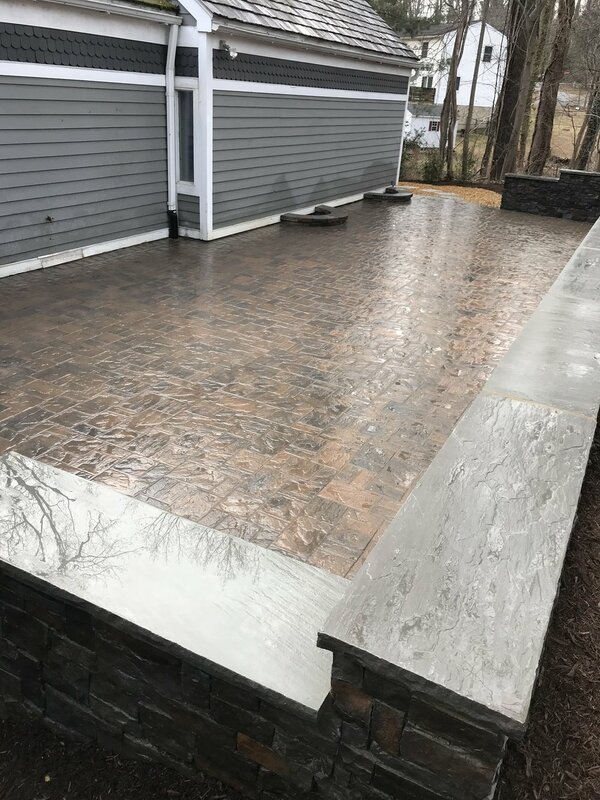 We installed a new paver patio with a sit wall and end column for the Rowe family in Prince Frederick. They are going to use this extra space to put in a hot tub! 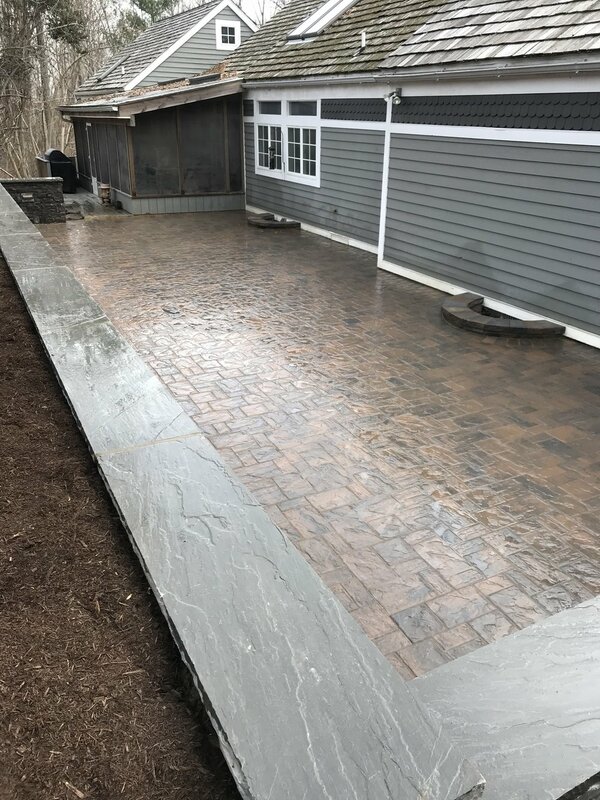 The stone used here is Cambridge Maytrx 6" wall block in Toffee Onyx color and Cambridge Roundtable 6x9/6x6 pavers in Toffee Onyx/Toffee Onyx Lite colors. 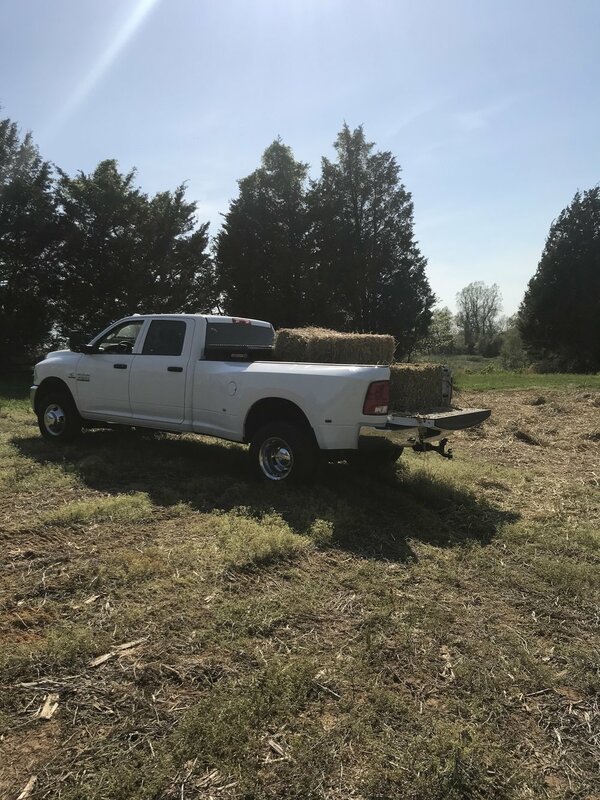 Here is a great review from Mr. Rowe after we completed the project: "Just Wow! Very Happy! Not as big a project as you've done before but 100% what we were looking for. Appreciate your great communication throughout, great suggestions, working quickly, and working as cleanly as possible. Happy to offer referrals whenever. Four thumbs up from us!" Replaced a standard concrete sidewalk with these contrasting paver colors. Overlaid the concrete porch and created stone steps leading to it. Turned out awesome! 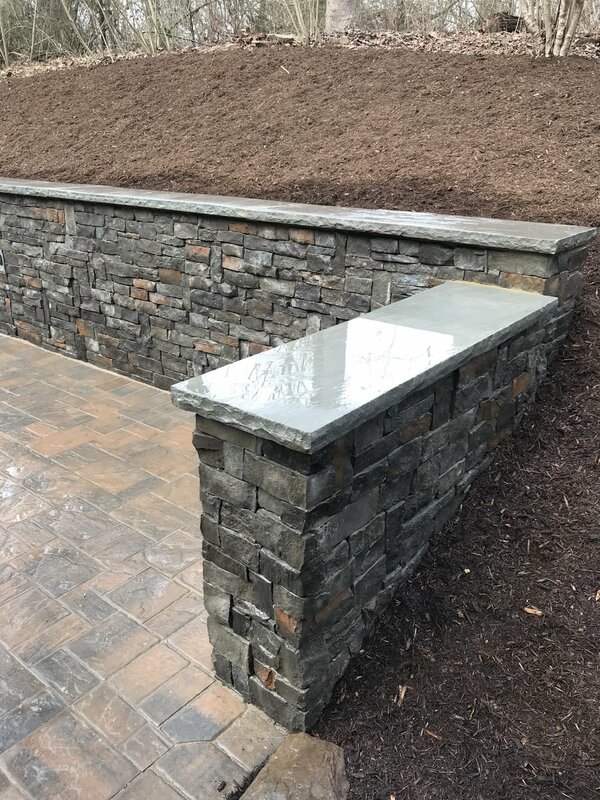 Cambridge Ledgestone 3-Piece in Onyx Natural color - Roundtable 6x9 border in Onyx color. 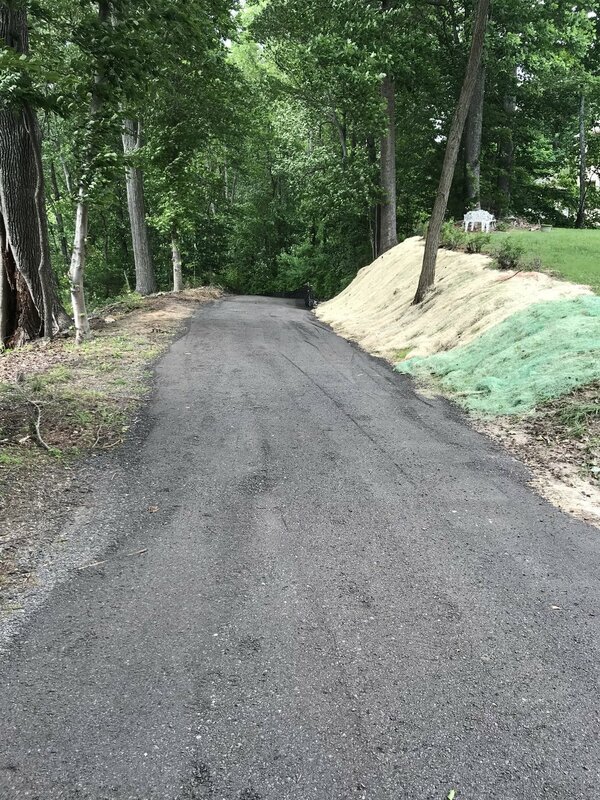 Making improvements to the access road leading to the community boat ramp for this HOA in Dunkirk, MD. 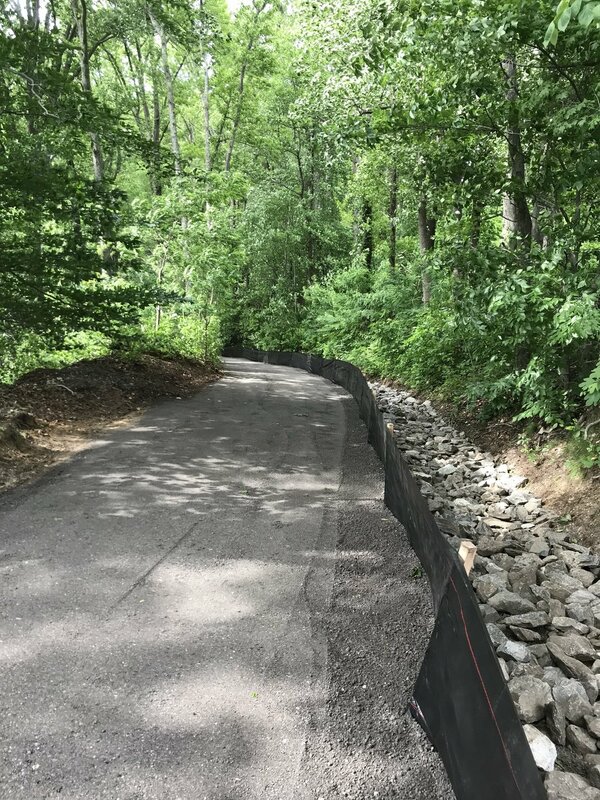 Some of the improvements included grading the road and adding asphalt millings, repairing erosion, removing sediment from the existing stone swales, cleaning sediment out of stormwater drains/pipes, and stabilizing steep slopes and hillsides. We got this road both usable and compliant in no time! Dropping a BIG poplar tree!!! Clearing a line of site for traffic at the new animal shelter on Route 231. A dry stack retaining wall to create a flower bed in front of this home. The use of Pennsylvania Field Stone is an awesome natural look to create a flower bed. A beautiful way to make your backyard space 100% usable. This project includes the following features: Cambridge Ledgestone 3 Piece Pavers in Toffee Onyx; Matryx Wall Block in Toffee Onyx with double sided caps for the window wells; Cambridge Canyon Ledge Veneer retaining wall in Midnight Slate colors; Solid veneer caps; low voltage LED exterior lighting. Grading out perc sites and stabilizing with seed/straw. Check out our new machine! Cat 289D CTL. A retaining wall and river rock bed we added to the front of this home in the Prince Frederick Crossing neighborhood. A bio-retention pond is used to collect and filter all stormwater run off from impervious surface on the property. 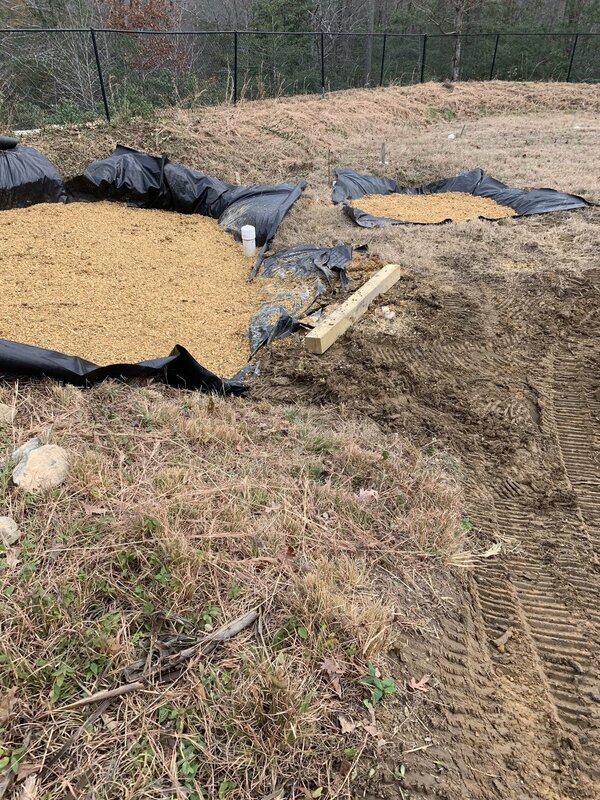 This new construction home, being built on the water, is required to filter it's own rain water before it is released back into the Patuxent River. All rain leaders from the roof and the trench drain from the driveway all lead to this pond to help filter the run off.